$500 In 24 Hours Without A Website? From the same author as the original groundbreaking report "Offline Gold For The Online Marketer". This report outlines a unique way to add an extra income stream from local business clients or to offer completely new clients. It doesn't even require a website to run. If you can write an email you can use this step by step system and charge local business owners $500 or a whole lot more to explode their sales. t stopped me dead in my tracks. A few weeks ago I was in my local shopping mall when I saw a local bookstore running a simple, inexpensive shop front display. Their store was packed with shoppers. I watched for a while and realized this bookstore had spent less than $50 on a store front display that was driving a huge amount of walk past traffic into their business. Even more important I realized that bookstore (and nearly every brick and mortar businesses) is throwing away a fortune they could be making if they used a system to combine a powerful store front display with a simple online marketing method. This is a system I've used with real brick and mortar business clients in the real world. And I'm giving you full access to my system if you act today. 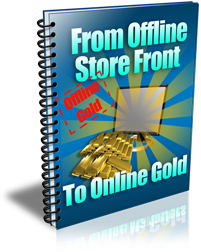 I've combined over a decade of retailing experience with over 7 years online marketing experience and created a special 43 page report "From Offline Shop Front To Online Gold." In this report I reveal step by step a simple system employing an inexpensive shop front display and turning that display into a long term online cash stream you can turn on and off like a tap. It's so simple you can start using it today. If you own a business you could have this system up and running in 24 hours or less for under $100 and you don't need a website to do it. The only internet skill you need is the ability to set up an autoresponder sequence of emails. An inexpensive autoresponder service like Aweber gives you full step by step instructions on how to do that. If you're already signed up to Aweber you're ready to go! Once you're up and running the only online skill you need is writing an email. And I'll even give you 5 professionally written emails you can adapt for any brick and mortar business. 5 simple steps you or your buisiness clients can follow to create a powerful store front promotion for less than $50. (You'll kick yourself when you see how dead easy this really is). How the "wall of products" secret can transform this promotional method from a mild success into a customer sucking blockbuster. The secret of a cheap (even free) 9 inch by 9 inch device that can turn your store front promotion into a valuable highly targeted email list you can contact over and over for years to come. How you can create a flood of business from your new email list by giving everyone a gift, a prize or both. The amazing way you can use this method to test offer after offer FAST and discover exactly which offers and promotions get you the largest response and generate the most profits. Why discounting is the lowest form of marketing and 6 different kinds of offers that will pull clients into any business without discounting. Think aobut it. You can have clients pouring through your door while you're charging full price..
You can finally take control of your business turnover. Or if you're a online marketing consultant you can become the rainmaker for your clients helping them make money at will any time of year. The secrets to creating a simple single paged A4 sized customer magnet. Get this right and you'll see people walking past your business stopping dead in their tracks and literally forced to come inside. Have you ever wondered how your best prospects can walk past your business without even seeing it? I'll reveal why people are blind to your business and the amazing way to blast through their consciousness and force them to stop and come inside. Why you might consider market stalls and trade stalls for promoting your buisness and the 2 biggest keys to making them work. Is "May I Help You?" Killing Your Sales? If you and your staff are greeting your browsers with a line like "may I help you?" you're annoying your prospects and driving them right out the door. I'll tell you how to speak to prospects so they'll stay in your store, be eager to buy from you and many times more likely to join your email list. Why you should focus on educating your prospects if you want to multiply the chances they'll buy from you. unethical scum bags. Warning: you MUST get this right or your subscribers will think you're a spammer too. How to make an income or bring in a steady steam of new clients by promoting other non-competitive businesses in your area. You'll discover how to turn your new email list into ongoing week to week income even if you don't have anything to sell your subscribers! The first thing your subscribers look at before they even open an email (hint: it's NOT the subject line). Overlooking this vital key will get many of your emails deleted without ever being opened. How to avoid the "trigger words" that will get your emails dumped by internet service providers and anti-spam software. If you want your emails to bring you real business you must know what these trigger words are. 5 professionally written, high powered emails you can adapt for your own use in your email promotions. You'll have the blueprint you need to set up a traffic stopping store display for peanuts. And the step by step instructions to turn that store display into an ongoing online income. If you're selling your online marketing services to businesses in your area you could easily charge $500-$1,000+ to set up this system and an ongoing fee of $100 to $500+ a month to run it. At $500 this report would be a bargain. But I'm not charging you $500 or even $100. If you act today you can claim your copy of "From Offline Store Front To Online Gold" for a tiny $19.99. The average brick and mortar business can make back the modest price of this report in less than 15 minutes of trading just from the extra business created. And at $500+ to set up the service as an online marketing consultant you'll make back many times the price just from your first client. But you must act now. At $19.99 the secrets revealed in this report are outrageously underpriced. The price must go up soon to reflect the report's real value. I'd really hate to see you miss out. You can create an explosion of new customers from the walk past traffic in any brick and mortar business. And you can turn that traffic into a huge, highly targeted email list that will bring a ongoing cash stream to that business for months and years to come. Whether you're a business owner yourself or you want to make money helping business owners in your local area. Either way you be up and running less than 24 hours after reading this amazing report and you can start cashing real money. Why struggle to earn a living when you can create an explosion of income so easliy?